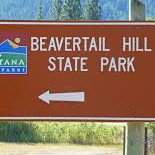 This campground offers 28 campsites, many are on the Clark Fork River. Each with a table and fire ring. There are also 2 tipis for rent that can accommodate 6 people. Unfurnished, however, has a picnic table and fire ring outside the tipi. There is an interpretive trail through thick cottonwood forest. Boating is carry on only. Open May 1 through October 31. Flushable toilets and water available. Activities: Hiking, fishing, wildlife viewing, picnicking, boating and canoeing. $7-24/night depending on site. Tipi $26-36. Maximum stay 14 days.